Land of Enchantment: Will Richardson Reveal All About UFOs? Will Richardson Reveal All About UFOs? 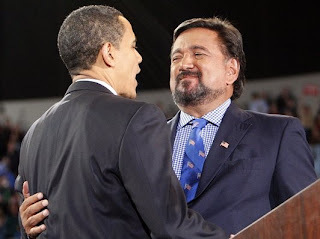 UFO enthusiasts are all atwitter about the possibility that Bill Richardson will be their designated truth-seeker in the new Obama administration. They believe they have good prospects of success after public statements of support from both John Podesta, who is running Mr Obama's White House transition team, and Bill Richardson, the Governor of New Mexico - a UFO sighting hotspot - who is expected to secure a cabinet post (emphasis added).